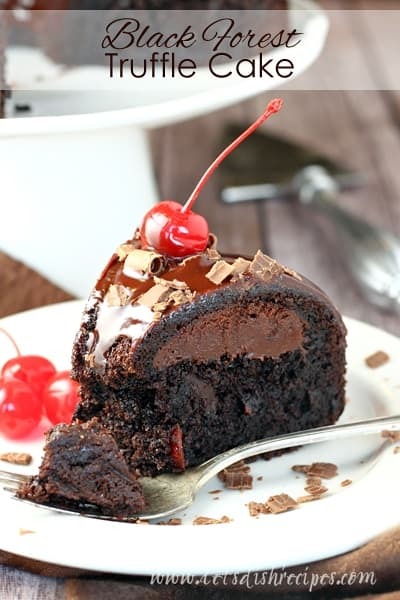 BLACK FOREST TRUFFLE CAKE — A decadent chocolate cherry cake with a tunnel of chocolate truffle filling inside and a rich chocolate ganache glaze on top. You guys! This Black Forest Truffle Cake has to be one of the best chocolate desserts I’ve made in a long time. 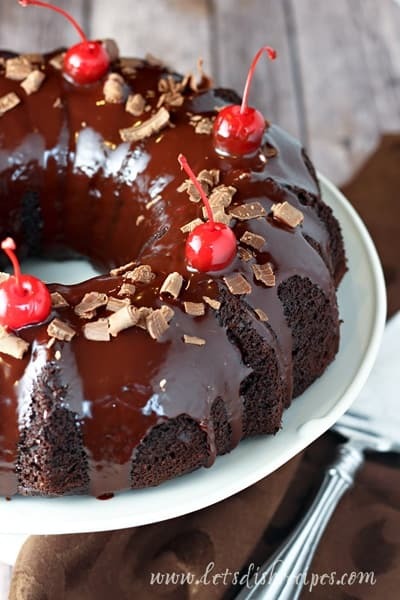 If you love the combination of cherries and chocolate, this decadent cake is a must try! Let’s just start with the cake itself. Forget that tunnel of chocolate you see in the center for just a moment. 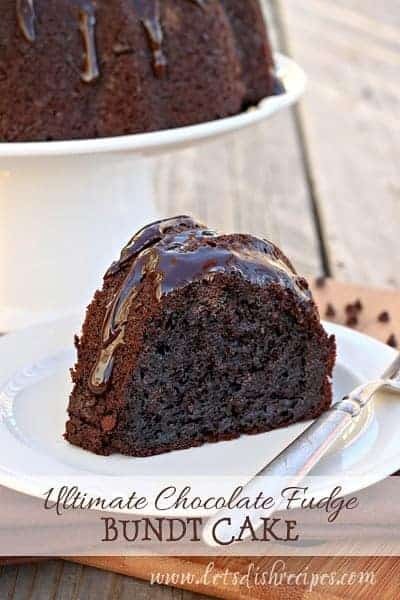 The chocolate cake is incredibly rich and moist. And studded with chopped maraschino cherries. On it’s own, it would be an amazing dessert. But then you add that chocolate truffle filling and you’ve got a chocolate lover’s dream cake! Really, it’s just like the filling you’d find in a chocolate truffle, but it’s in your cake! And did I mention the chocolate ganache glaze? The best part–this cake starts with a cake mix, and it’s actually super easy to make. But go ahead and tell everyone you spent hours in the kitchen. Because they’ll totally believe you. This is definitely what I’d call a “special occasion” cake. It’s perfect for birthdays, parties, holidays and all kinds of celebrations. And just because it’s special doesn’t mean it has to be difficult or time consuming. My husband is a huge fan of any kind of black forest dessert, so I can definitely see myself making this again for his birthday. But it was a hit with everyone at my house, and with the neighbors we shared with. I mean, I didn’t really want to share, but since I couldn’t resist this cake, it was best for my waistline to give some away. If you’re looking for a showstopping chocolate dessert to serve at your next party or celebration, this Black Forest Truffle Cake is just what you need. But don’t wait for a special occasion. You really need to try this cake as soon as possible! Be sure to save this Black Forest Truffle Cake recipe to your favorite Pinterest board for later. 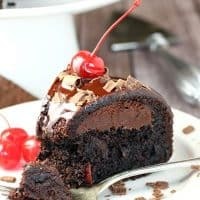 A decadent chocolate cherry cake with a tunnel of chocolate truffle filling inside and a rich chocolate ganache glaze on top. Preheat oven to 350 degrees. Grease and flour a 10 cup bundt pan. In medium microwavable bowl, microwave the filling ingredients on high for about 30 seconds, stirring halfway through. If needed, continuing microwaving at 10 second intervals until filling is melted and smooth. Set aside. In a large bowl, beat the cake mix, water, butter, 1/2 teaspoon almond extract, eggs and pudding mix with and electric mixer until smooth. Fold in the cherries. Spoon half of the batter into prepared pan and spread evenly. Bake for 15 minutes. Remove pan from oven and immediately drop spoonfuls of filling over batter, keeping filling away from sides of pan. Carefully spoon remaining batter over top and spread evenly. Bake and additional 45 minutes longer, or until toothpick inserted near center comes out almost clean and cake springs back when touched lightly in center. Cool cake in pan 15 minutes. Loosen cake with knife around center and edges of pan. Turn cake upside down onto cooling rack or heatproof serving plate. Cool completely, about 1 1/2 hours. In a small saucepan, heat heavy cream over medium low heat until bubbles just begin to form around the edges. Meanwhile, place the chopped chocolate and corn syrup in a small bowl. Pour hot cream over the chocolate and whisk until smooth and shiny. Let cool and thicken slightly, then spoon ganache over cake, allowing it to run down the sides. 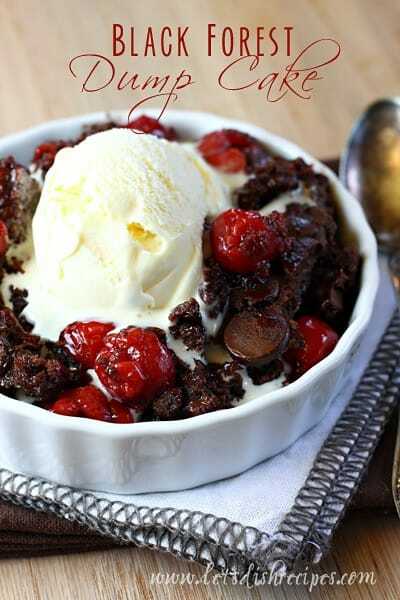 If desired, garnish cake with chocolate curls and whole cherries. Store loosely covered in refrigerator. Well sheesh this is beautiful and perfect. Wow! It’s a beautiful presentation of this classic cake flavor! Is there a reason that there is no description in Item 2? I think that was just a typo. All of the instructions should be there. If I use a boxed cake mix, it has been Pillsbury Moist with the Pudding in the mix. Would you still add the pudding? I just purchased a Ghirardelli Cake Mix. Could you use Ghirardelli Dark Chocolate Wafers, in place of the chocolate chips? I would still add the pudding, but you don’t have to. And you can use 4 ounces of any kind of chocolate for the ganache.